If you like outdoor swimming and have traveled in Europe you’ll have been delighted to discover that swimming in rivers and lakes is very much the done thing. When on holiday in Switzerland a couple of years ago it was obvious that everyone wanted to swim when the sun shone. Lakes in Switzerland have multiple swimming places built all around them with diving boards; pontoons and changing facilities providing opportunities for fun in the water that are convenient for all. Because of our unique history both as an Empire and as the birthplace of the Industrial Revolution we find that our swimming freedoms have all but vanished, well, that is until quite recently, but astonishing things can and do happen don’t they! Just as I was enjoying the freedom to swim in the expansive swimming area at Swan Pool (Sandwell Valley Country Park) in Birmingham at the weekend, Robert Aspey was enjoying his freedom at Rutland Water (pictures above). What’s more astonishing still is that this year a new Aqua Park with slides and play equipment in the lake itself has opened for business. Rutland Water Bathing Beach has been a tremendous success; it now looks much more like a European lake than a British one. This development is very significant. It shows a tremendous confidence that there is money to be made from outdoor recreational swimming. As there is no charge to use the bathing beach, lifeguard costs are covered by car parking charges and an array of seaside amenities that are springing up in the beach area. 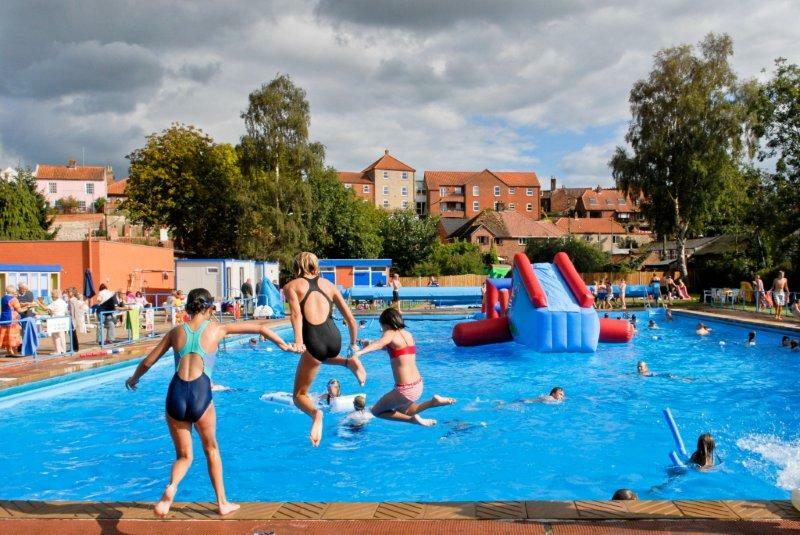 To use the aqua park for 55 min’s adults and children pay £15 plus £5 to hire a life jacket and another £5 for a wet-suit if desired. This just goes to prove what has been said all along; open an outdoor swimming beach and people will come. So with these two excellent and successful examples under our belt, just as we exit Europe we may see more opportunities to get into the swim of things. Test your knowledge at the end! 1862 WARNING: To Bathers. All persons who are found bathing in the RIVER WAVENEY between the Smelt House and 200 yards below Beccles Bridge after 9 o’clock in the morning, will be PROSECUTED according to law. 1867 COUNCIL: Public Bathing Place suggested. 1873 Saw the purchase of the Old Granary on the banks of the river Waveney in Puddingmoor for the sum of £300. The building was to be used as a dressing room for people bathing in the river. 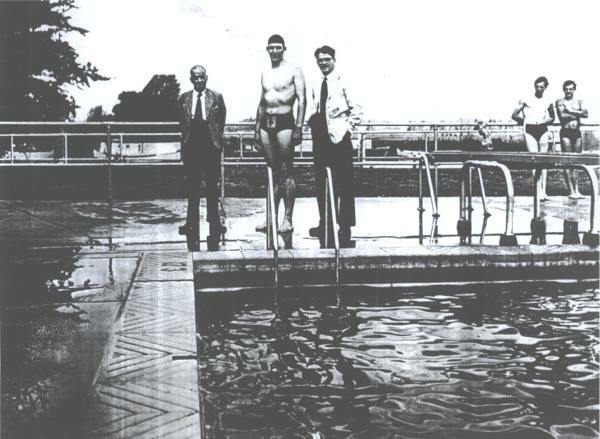 This was the beginning of the history of organised Outdoor Swimming in Beccles. The old bathing place still much used. 1874 Council: Bathing Place should be made deeper. 200 a day used it when very warm; 100 when cooler; 50 a day now (September). 1875 Ladies to have special time for using Bathing Place. 1881 BATHING PLACE: (LETTER): Some years ago a spot about 300 yards up the river was the only recognised place for bathing, but it was hampered by a halfpenny fine to reach it, for ferrying across the river. There was difficulty about getting a right of way to the Bathing place. The Corporation decided upon making a new bathing place. They purchased propertyalongside the river, but unfortunately a bungle was made of the scheme, and the outcome was an old granary fitted up in rough and ready style, and a limited quantity of enclosed water. This was all very well for youngsters learning to swim, but the grand mistake was in ignoring the large number of persons who can swim, and to whom it is no pleasure to be contained to a small breadth of filthy water. The old bathing place is still used by many who desire to enjoy a wholesome bathe. A better spot could not be found for miles around. Until within the last two or three years the ground shelved gradually down to the middle of the river, which is deep, free from weeds, and suitable in every respect for the swimmer. Now holes have been dredged in the shallow side, and it is positively dangerous. Only the other morning a lad, trying to swim, got into one of these holes and was nearly drowned. 1894 108 yards of the river frontage was cordoned off and enclosed with and post and plank fence. The planking was fixed to stout posts, driven firmly into the bed of the river, a gap below the fence allowed the flow to change the depth of water. Cubicles were built for changing rooms: one set for ladies and one for the gentlemen separated by a large communal changing room for youth and boys. For girls there were six or eight wooden huts. 1895 NEW BATHING PLACE used by 30,000 bathers this Summer. Never before has there been such a run on the place as a result of the long and hot summer. 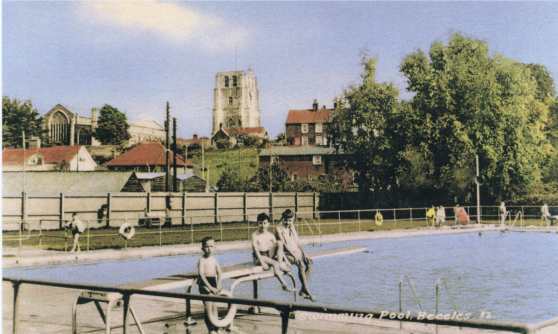 1922 The Town Council agree to allot separate hours to schools for children’s swimming lessons. The Council also agreed to the installation of 3 spring boards with the centre one to be made rigid (no longer in existence). 1930s The entry fee was 2d for Adults and 1d for children. 1959 Construction of a new Bathing Place adjacent to the old one began and was completed in the same year. 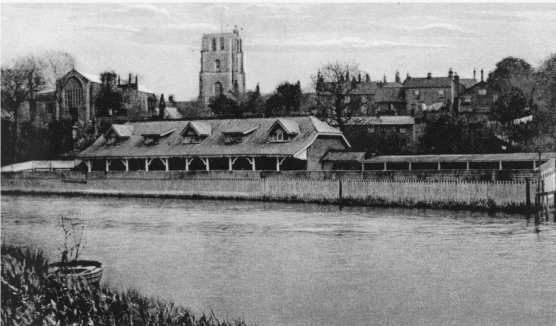 The result is what remains today; Beccles Outdoor Swimming Pool. 1975 Saw the installation of Heating for the Pool. Our Sceptered Isles unique culture is standing in the way of the free swimming movement. Across Europe and throughout America, outdoor swimming is a given during the summer months, but not so in good old Blighty. Outdoor swimmers, wild swimmers, whatever they prefer to be called are increasingly frustrated at the swimming restrictions imposed upon them. True the risk of unsupervised outdoor swimming is greater than swimming under the watchful gaze of lifeguards at an indoor pool, but is it morally right to lock swimmers out of sight even if out of danger? Surely no one would suggest that cyclists give up the open road in favor of a spin class, even if that meant they could never again have an accident. No one would insist that marathon runners compete on tread mills rather than training and competing in the street, no matter how fancy the setting. But uniquely in England, swimmers have had their freedom curtailed. The great outdoors is out of bounds to the vast majority of budding enthusiasts. Is their any wonder that swimming is in decline? Of course you cannot monitor every pond, riverbank and lakeside across the country and so scare tactics have been employed to keep swimmers under control. From an early age we are indoctrinated with the teaching that if we swim in rivers and lakes we are dicing with death. However a new movement, entirely separate from the wild swimming community is raising the issue of prejudice in the swimming environment. The outrageous suggestion has not only been muted, it’s being implemented; to go ahead and build a natural swimming pond in Kings Cross. This building site location will be transformed into a swimming pool oasis for local residents and visitors. Entrance prices will be comparable to local swimming pools and although unable to accommodate up to 2,000 bathers each day as the larger pools in Germany, Switzerland, Austria and Italy do, this small pool is still big enough to welcome 163 bathers each day in warm weather. Like so many pools across Europe, this bathing oasis will have it’s waters naturally cleansed using plants to filter out impurities just as happens in a natural pools. It seems ironic that with all the natural pools across the country this man made pond will be the first of its kind in the UK. But in early 2015 and for 20 glorious months thereafter, Kings Cross will become a swimming mecca. This pool will put outdoor bathing on public display, it will achieve what has not been possible until now, it will show that outdoor swimming is acceptable, desirable and achievable. If you would like to know more about the changes London will see over the next few years why not visit the Roca London Gallery and see the free exhibition: Urban Plunge. To understand the British prejudice towards outdoor swimmers please see the book: Hung Out to Dry Swimming and British Culture, but be prepared, read this book and you will see the British as never before! Just as we had to learn the Green Cross Code before being allowed to cross the road on our own, both adults and children need re-educating in water safety. Today there is much debate as to the right costume for outdoor swimming. Are you really a wild swimmer if you were a wet suit or should you just wear a swimsuit and brave the cold? Now in days gone by the issue was a little more sensitive. When day trips to the seaside became fashionable and when both sexes wanted to bathe, something had to be done to protect public decency. Separate bathing areas for men and women were established on the beach and the introduction of bathing machines became a tantalizing spectacle for spectators gathered on the promenade. Hot sunshine, beautiful scenery and cool water the perfect recipe for a lifelong memory! Teach children how to SWIM SAFE in open water. 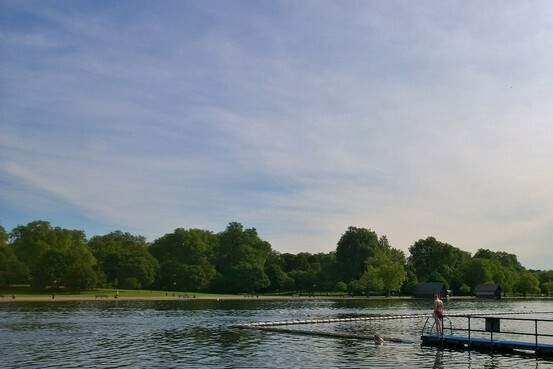 LONDON—This is Emily Chong’s routine, rain or shine, winter or summer: Wake up, eat breakfast, cycle to Hyde Park, jump in a lake, swim a bit, fuel up with a second breakfast, cycle to work. One chilly morning this year, she found a team of police divers alongside the lake’s resident swans, looking for the body of a man who had drowned the night before. Ms. Chong put on her Spider-Man swim cap and dived in. “As I swam, I kept getting an image in my head that a body would just float up,” she recalls. London’s outdoor swimmers are a serious bunch. Ms. Chong and other members of the Serpentine Swimming Club have the right to swim in the lake before 9:30 in the morning. Sometimes in winter, it partly freezes. The cold water numbs the sting of scrapes from sharp bits of ice. 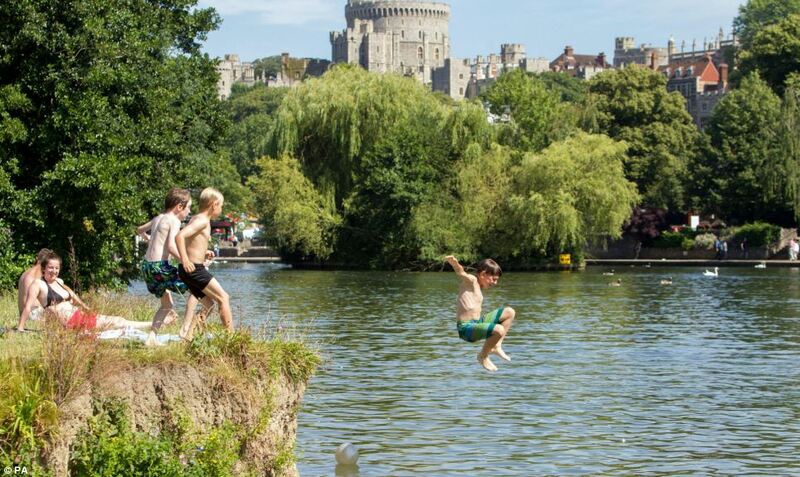 Hardy Londoners regularly take dips in lakes, ponds, basins and unheated al fresco swimming pools. The Outdoor Swimming Society, which fights to free swimmers from “chlorinated captivity,” now has 18,000 members. It had just 300 in 2006. “Wild swimming” is so popular that architects and engineers are now plotting a return to London’s most famous waterway, the River Thames. But the challenges are many: vicious currents, swelling tides, dirty water and a fleet of fast catamarans that ferry commuters.